Pugs are adorable, squish-faced little dogs with unique personalities to match their looks. They have quickly become a favorite breed amongst pet owners all around the globe. While having one of these quirky pups is sure to bring pleasure to your day in, and day out, you want to make sure that they are eating the best food possible. The best dog food for pugs will give them the energy that their bodies need, low calories, so they do not gain weight rapidly and makes sure that they are absorbing the essential nutrients that their bodies need to be happy and healthy. With how many dog food options there are available it can get tricky picking out the right one your pug needs. Look no further as our list gives you a variety of different dog foods to pick one from, each benefiting the overall health of your beloved pug. 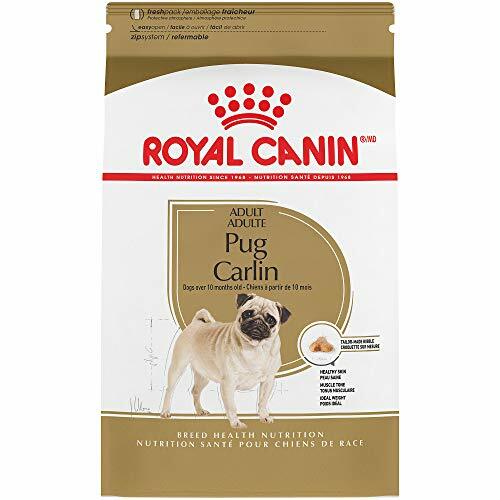 When looking for the best food for pugs why not chose Royal Canin Pug Adult Food as it caters specifically to the Pug breed. Pugs need a specific diet that best caters to their unique body type. Because of their wrinkles, they need a diet that will strengthen their skin and provide essential nutrients that their wrinkly skin needs. While small they are muscular, so Royal Canin provides enough protein that will give them the healthy calories boost, without risking weight gain that they need. Pugs are well-known for their small, squished faces, which can make eating regular dry food a hassle. Royal Canin’s bites are specially made to be easily picked up by your pug so they can eat comfortably and satisfy their tummies. Your pug will fully benefit from Royal Canin Pug Adult Food to make sure that they are happy and healthy throughout their lifetime. 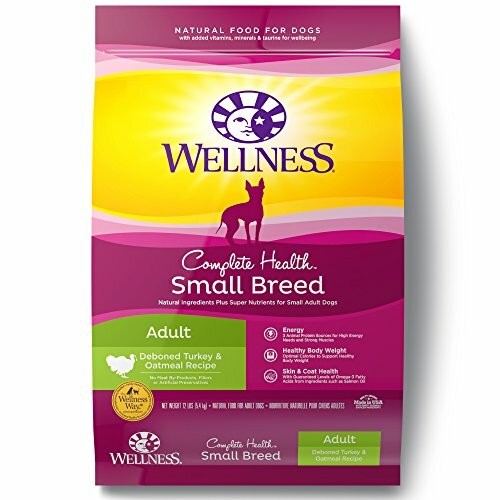 Wellness Complete Small Dog Food Formula is specifically made to support the needs of small dogs like pugs. Pugs may have little bodies, but they deserve a diet that will fully benefit them. Wellness Complete uses a mix of high-quality animal proteins, fruits, vegetables, and grains to provide Pugs with the essential nutrients that they need. Each portion is formulated to ensure that your Pug will get the calories and energy content that they need without risking them getting overweight. Not only that, but they will get an optimal blend of fine fibers and probiotics that will promote an ideal digestive system and better poops. An ideal level of Omega Fatty acids makes sure that your pup will have a healthy skin and coat, which is essential for the wrinkly skin of a pug. You want to avoid giving small breed dogs a diet that will harm their body more than help, and Wellness Complete Small Dog Food Formula. 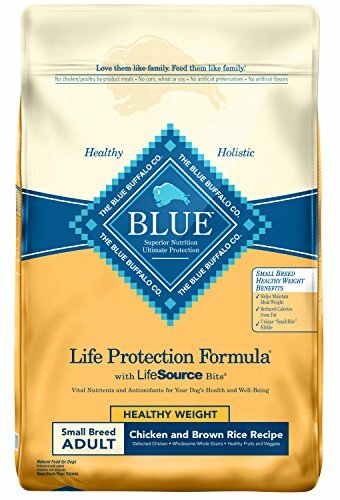 WEIGHT MANAGEMENT DOG FOOD: Formulated with reduced calories from fat to help small breed dogs achieve and maintain healthy weight, BLUE Life Protection Formula Small Breed Healthy Weight dry dog food also contains increased levels of protein to help meet higher energy needs. It is no secret that Pugs tend to gain weight rather quickly, so, to prevent that from occurring in your pug, feed them Blue Buffalo Small Breed Healthy Weight. Pugs need a higher calorie count since their bodies burn calories faster, but they cannot have an overwhelming amount as they can gain weight rather than maintain it. Blue Buffalo Healthy Weight Formulas uses lean animal proteins, so your Pug gets the animal proteins their bodies need while controlling their weight. Not only that, but the Blue Life Protection Formula boosts your dog’s immune system, can be fed at all life stages and provides a precise blend of antioxidants, vitamins, minerals, and nutrients that dogs need to have strong and healthy bodies. When you start to feed your Pug Blue Buffalo Small Breed Healthy Weight, you will see a significant improvement in their overall health, especially their weight. 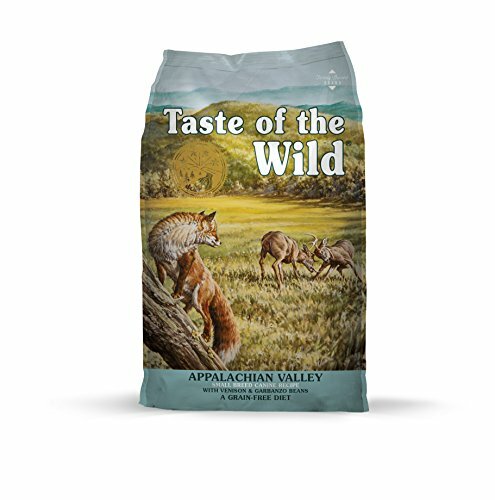 Taste of the Wild Small Breed Formula uses venison as its main animal protein, which is easy to digest and an optimal protein source for small dogs. Taste of the Wild’s Small Breed Formula is rich in proteins and fats so that small dogs can have the ideal energy source that will keep them active and happy. Venison is one of the best animal proteins for your dog to eat as it is one of the least likely to cause allergies, is easy to digest and is lean meat, which Pugs need to avoid excess weight gain. To provide the Probiotics that small dogs need, Taste of the Wild adds 80 million live, active cultures that help support healthy digestive and immune systems. To further maintain digestive health, garbanzo beans, and dried chicory root give your Pug the fiber their bodies need. Cater to your Pug’s special bodily needs all in the handy dog food formula that Taste of the Wild Small Breed Formula offers. When looking for the best food for pug puppies, nothing can beat the small bites of NutriSource Small Breed Formula. 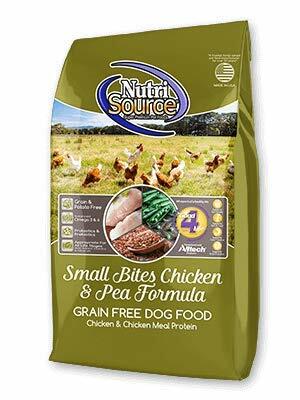 NutriSource is packed full of all the essential nutrients tailored explicitly for small breed dogs. 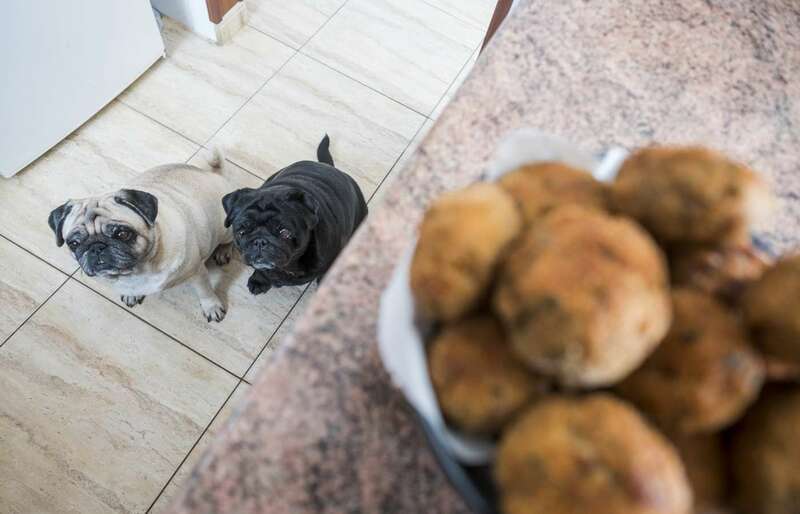 Not only are the bites easy for a Pug to eat, but they have a high protein source thanks to the high-quality chicken being the first ingredient. By eating NutriSource, your Pug will have better digestive health, better mental health, and a stronger immune system. Best of all, it can control any foul odors that may come out of your Pug from both ends. Start feeding NutriSource to your Pug at an early age and keep feeding this formula to them as you will not have the change the formula as your Pug ages. And it is such a high-quality dry food you can switch between flavors with little risk of upsetting your dog’s stomach. Your Pug’s little tail will not stop wagging, and you may need to mop up some drool after when you feed them NutriSource Small Breed Formula as it is one of the best dog foods available for pugs. Pugs have it a little bit easier than us with having a weight control diet when feeding them Purina Pro Weight Management. If your Pug needs to maintain their weight do not sacrifice flavor for results; your Pug can still enjoy a tasty meal and keep off those excess pounds. 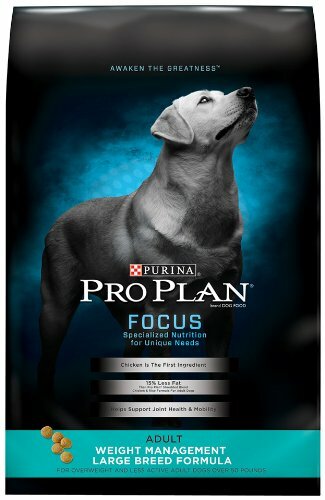 Purina’s Weight Loss formula contains less fat than the standard recipes since it uses leaner chicken as the first ingredient. Even though the animal protein is lean, it will still promote strong and lean muscles so your Pug will not lose energy fast. While this recipe does contain grains, the grains are all-natural and provide dogs with an optimal fiber source that helps regulate their stomachs and maintain a healthy digestive system. Never hear someone body shame your Pug again when they eat Purina Pro Weight Management. For a high-quality dog food that is sure to keep your Pug in top shape feed them Diamond Naturals Small Breed Formula. Chicken is the primary ingredient of this size specific formula as it is easy to digest and comfortable on a small pup’s stomach. The 27% protein and 16% fat ratio provides small dogs, like Pugs, with the nutrients necessary for them to have a happy and active lifestyle. Do not be thrown off by Diamond Naturals using grains in their dog food as they are wholesome and naturally obtained to ensure your Pug is getting the optimal fiber source that they need. 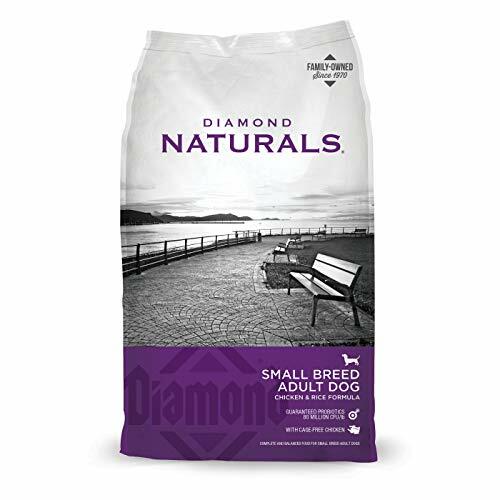 Diamond Naturals Small Breed Formula is sure to provide your Pug with all of the essential nutrients that they need in easy to eat kibble sizes. Recipe Provides Grain-Free Nutrition With No Gluten Ingredients For Easier Digestibility, Includes Omega Fatty Acids For Healthy Skin And Coat And Contains Probiotics And Prebiotic Fiber For Optimal Digestion. Merrick Lil Plates Small Breed Formula is specially designed to cater to the pallet and bodily needs small dogs need. 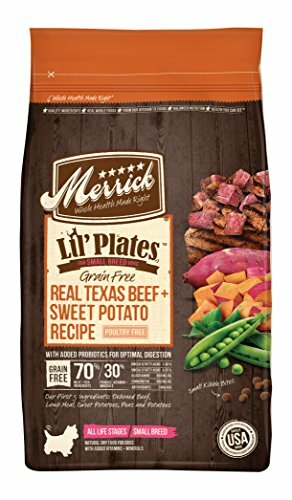 Merrick Lil Plates has small, bite-sized kibbles that are perfect for Pugs to be able to scoop up in their mouths and eat happily. All of the ingredients are grown and sourced in the USA to ensure that dogs only eat the highest quality of ingredients with the most nutritional content possible. A healthy blend of fruits, vegetables, and added vitamins helps your Pug to have the healthiest and strongest body possible with no extra effort on your part. Once your Pug tastes the delectable taste of Merrick Lil Plates Small Breed Formula, they will not want to eat anything else. Your Pug will feel like you are pampering them when you treat them to the Cesar Small Breed Dog Food. 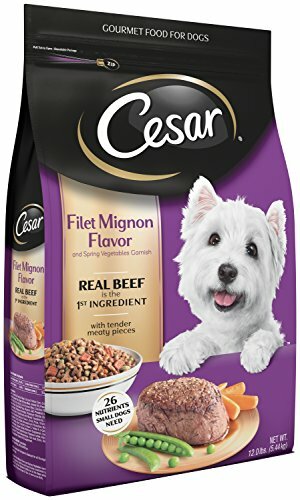 Cesar uses only the highest quality ingredients in their dog foods. Your Pug will feel like they are eating at a fancy dinner at each meal. But compared to elaborate meals, this dog food will provide your pug with all of the quality nutritional needs that their small bodies need. Grains are used in this dog food, but they are used as a fiber source rather than as a filler ingredient. But when you look past the grains, this is still a top quality, nutritious dog food. While you are having your fancy dinner, your Pug will be as well when they chow down on Cesar Small Breed Dog Food. 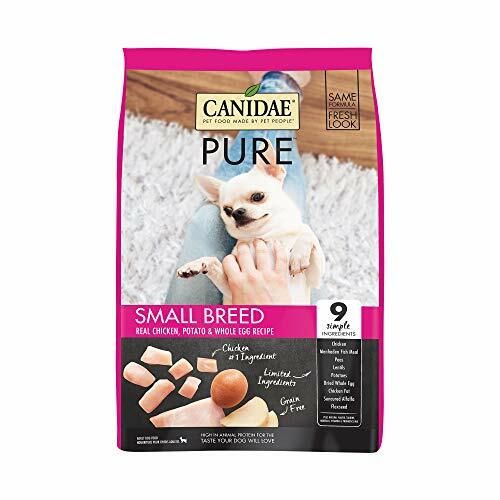 If you are looking for a limited ingredient diet that is still an optimal nutrient source for your growing Pug, then they need Canidae Pure Dog Food. Pugs are prone to developing food allergies, so to make it easier both on you and them to prevent any annoying flare-ups Canidae is there to help. Limited ingredients are used to be sure no allergic reactions occur, and they even go far and beyond to not use any wheat, grains, or corns in their formula. All of the ingredients are guaranteed to provide your Pug with the nutritional content that their little bodies need. Better yet, if your Pug happens to be a picky eater they should have a better, and more eager, time eating Canidae due to its irresistible flavors. By turning to Canidae Pure Dog Food not only will your dog have a healthy body, but you will also prevent any reactions or flare-ups if your dog is known for having food allergies. You should have a better idea now on what types of dog foods can be considered ideal pug food. 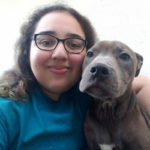 The main concern you should have is the quality of ingredients used in the food as that is where your dog will be absorbing all of its nutrients. It is okay for some dog foods to have grains and still be considered one of the best foods for pugs, but you have to be sure that all the grains are wholesome and are not the first ingredient on the list. As long as an animal protein is the first ingredient on the list as dogs need a high animal protein source to strive. You also need to be sure of the calorie content in the dog food you are considering since pugs do tend to gain weight rapidly due to a low activity level. When you find the right balanced dog food, then you will have a happy, healthy pug for many years to come. If you're looking for a reliable and effective dog food brand for your dogs, check out our review of the best dog food for pugs now!